Good to Great – Who is on Your Bus? I few years ago I read a book called Good to Great. Not everything applied to me as I was transitioning from the corporate world to the creative. But something in my reading jumped out and bit me! I read that as a good leader, I was essentially a bus driver. The bus, my company, is at a standstill, but it’s my job to get it going, and in the right direction. I have to decide where we are going, how we are going to get there, and who is going with me. Who is going with me? When you trust and invite someone on your bus, it doesn’t happen overnight. I learned from another great leader, Chris Morgan, Worship Pastor at 12Stone Church that you need to watch potential leaders like a hawk. Don’t be too quick to invite them on the bus. You need to do a little life with them first. Watch how they react to conflict, difficult people, how do they handle power? Money? Are they honest? How do they take constructive criticism? Do they value people? 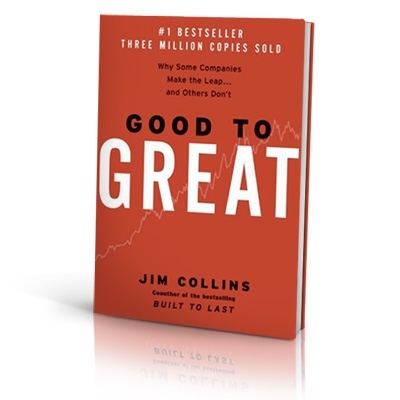 Check out this quote by Jim Collins from Good to Great. I believe I have the right core team in place (on the bus) to go from good to great. They are masters in their craft and I for one couldn’t do this without them. This is one of my favorite books!!! Collins gives us so many great insights in. Personally, I strive to be a Level 5 Leader and constantly self-examine to determine how I can be better at that. I find when you take your leadership principles from the bible, it lines up perfectly with those all important Level 5 traits: humility, elevating others, building a team (community), and striving to shore up our weaknesses. Also, something Collins does not talk about which I believe is important – always ask God to take control of business (and personal) interactions so that He will be glorified and will surround the transaction with his holy spirit. I really like what you said about don’t be too quick to invite others on the bus, do a little life with them first. I never heard it quite put that way, but way a great way to state it! It’s true, though, a persons true character, integrity and motivations emerge over time and it’s important to know who you are aligning with.